We are looking again at how resumes are being usurped by beautifully simple apps <like this and like this> and smart, forward-thinking individuals whose personal brands are showing the way to the future of (finding) work. 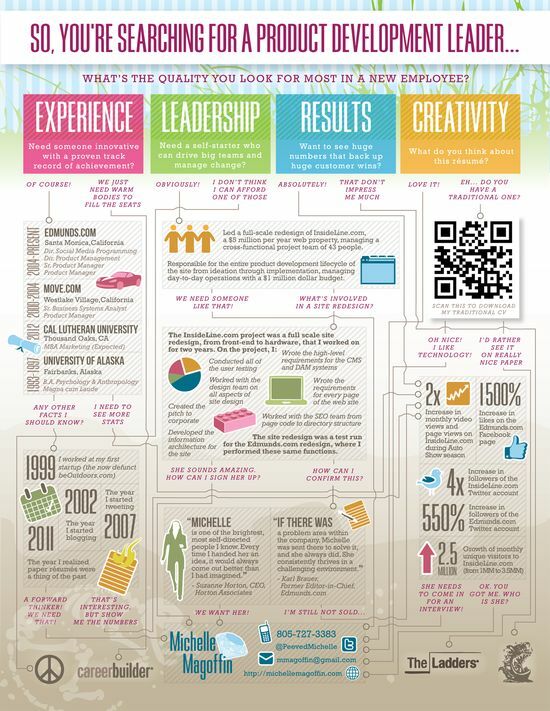 I realised that, in a previous post on personal brand resumes, I had broken the link to the best example of an infogrpahic resume I had so far found. So, here it is again. Not the most beautiful, but so clever in taking people on a journey of discovery. And that is the narrative secret to branding success. More on personal branding here and here.